Friends’ refusal to participate in war, or to fund war and militarism through taxes, has been witnessed to throughout our history. Our understanding broadened in the 20th century when we recognized that, as all of us are endowed with conscience, anyone can develop a conscientious objection to war. We may develop this conviction while serving in the military and experiencing war or preparations for war. For a precise history of conscientious objection in Canada among the peace churches and others, read this short paper. Since 2003 CFSC has again been helping American soldiers and their families – those who refused to participate in the Iraq War and came to Canada seeking refuge. Most of these young men and women served in Iraq (or Afghanistan) and developed their conscientious objection to the war (or all war) through this experience. 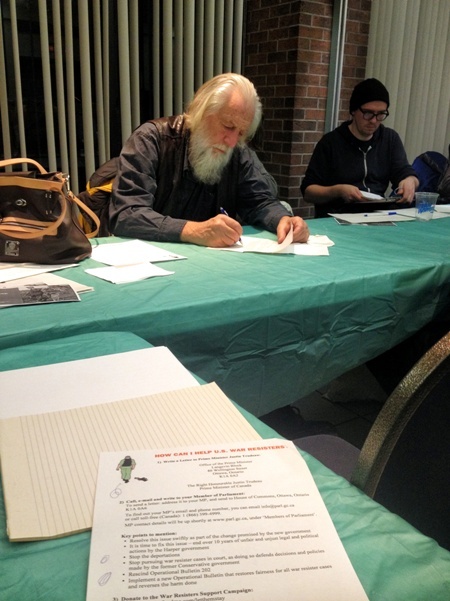 CFSC has worked in partnership with the Quaker United Nations Office (Geneva), Canadian church partners (the United Church of Canada and the Mennonite Central Committee Canada), and the War Resisters Support Campaign on helping the US War Resisters stay in Canada. the differential punishment that US war resisters have faced if returned to the US (most deserters received administrative discharges; those who spoke out against the Iraq war, such as the war resisters, received harsh prison sentences). 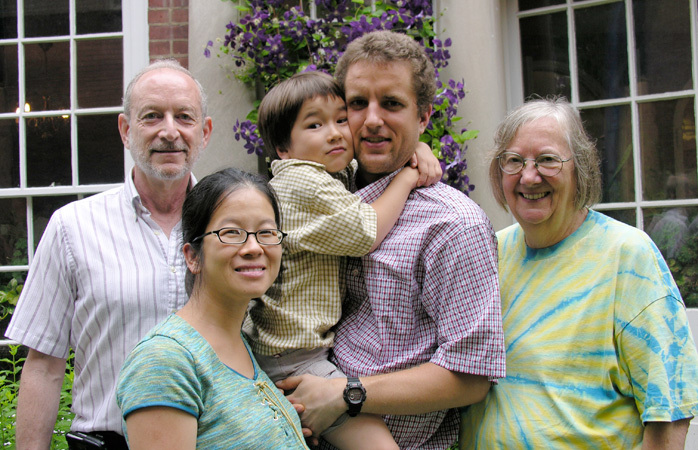 Our support for the US war resisters has included coordinating material support through the Quaker community, encouraging their engagement with elected representatives, providing letters to the court citing our concerns about process and legal issues, and preparing interventions raising substantial issues to raise with the court. One case we prepared an intervention for (the Hinzman decision at the Federal Court of Appeal) set a vital new precedent – that, in humanitarian and compassionate grounds applications, the Minister of Immigration must consider the applicant’s sincerely held beliefs and motivations as a part of their personal circumstances. CFSC also presented a brief to the House of Commons Standing Committee on Citizenship and Immigration in 2006. 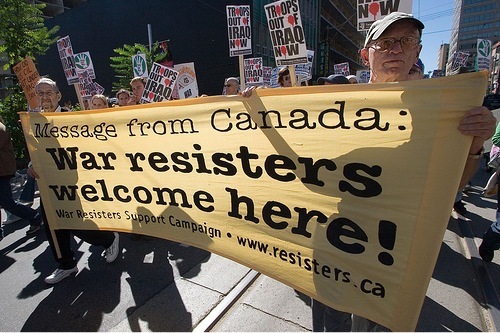 Two parliamentary motions supporting US War Resisters being able to stay in Canada were approved by Parliament in 2008 and 2009, but the government refused to implement them. In some countries the form to apply for recognition as a conscientious objector is easily to find and anyone who submits it is automatically recognized with no further questions asked. In some countries COs do not have to do any alternative service. Yet in many places COs are harshly punished. They may not be legally recognized, be given long period of alternative service, or be imprisoned (sometimes many times for the same refusal to serve in the military). If you’re interested in the legal status of conscientious objection and how it is implemented around the world these resources are helpful, in particular the overview created by the Quaker United Nations Office (QUNO)-Geneva. Find up to date information on CO issues from around the world via War Resisters International. In the 1990s, CFSC, with Mennonite Central Committee Canada, pressed the Department of National Defence to put into place a process for Canadian military personnel who developed a conscientious objection to war. A policy and procedure was put into place in 2004. It does not include independent review of the application and does not meet the standards of international law. In the 2000s, CFSC began addressing youth and militarism issues, producing a popular brochure used by local groups involved in counter-recruitment. Our approach has been to encourage reflection and critical thinking for those considering such a choice. For copies of the brochure contact us. Canadian Yearly Meeting supports conscientious objection to military taxation as a personal witness of Friends and enables its employees to withhold war taxes on request. Friends in Canada have a 200+ year history of refusing to pay taxes for war. People with a conscientious objection to having their taxes used for military purposes can register their objection by completing a Peace Tax Return at tax time each year. Conscience Canada, which produces the Peace Tax Return and does related work, was founded by Friends (Edith Adamson in particular) and others in 1978 in Victoria, BC. Individual Friends continue to volunteer with Conscience Canada.